While records were shattered left and right, the season ended with a familiar conclusion — a championship just out of grasp. For the fourth straight year, the No. 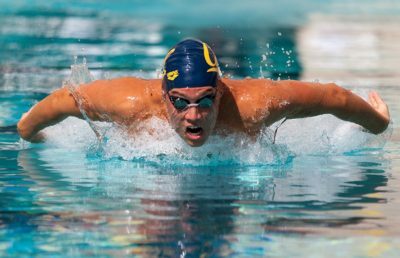 2 Cal men’s swim and dive team finished as the runner-up at the NCAA Championships, just behind Texas, which claimed its fourth consecutive national title Saturday. In this year’s event, the Longhorns compiled 449 points, while the Bears collected 437.5 points, the closest margin of victory since 2002. The end result extends Cal’s consecutive top-two finishes to nine, the most since Michigan reeled off 12 such seasons from 1937-1948. While Cal outscored the rest of the field in the swimming events, the Bears fell short by a costly margin in the diving events. Texas scored 81 points on the boards, whereas the two Cal divers failed to make either the “A” or “B” Finals to score points. 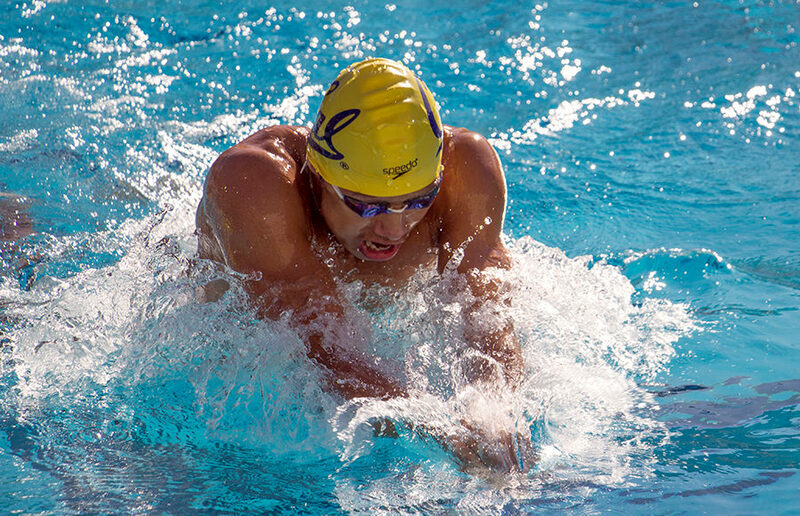 Several swimmers, however, impressed in their final showing of the season. 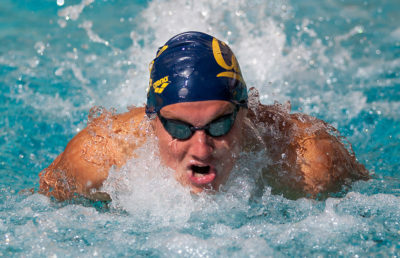 Junior Andrew Seliskar led the Bears in individual events with 47 points and three “A” Finals swims. His best finish was in the 200 breast, finishing just a quarter of a second behind first place with a time of 1:50.42. Seliskar also recorded the fastest 200 free swim in school history as part of the 800 free relay. Meanwhile, junior Nick Norman pieced together a third-place finish in the 1650 free at 14:30.82, tearing apart the previous school record of 14:39.00. 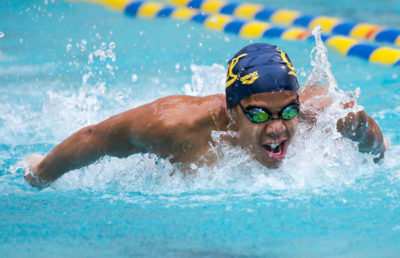 In all, Cal sent three swimmers to the “A” Finals in the 100 fly — seniors Justin Lynch and Matthew Josa along with freshman Ryan Hoffer — all of whom scored double-digit points in the event. Where the Bears’ depth shined brightest, however, was in the relays, an area that featured a handful of school records being eclipsed. In the 200 medley relay, Hoffer and Lynch joined with freshman Daniel Carr and senior Connor Hoppe to set a new American and school record in a blazing 1:21.88. Another school record was taken apart once again in the 200 free relay, as Hoffer and Lynch were again part of a group that claimed another Cal best. This time, the pair combined with sophomores Pawel Sendyk and Michael Jensen to produce a 1:14.56 swim, good for third place overall. The final event of the meet, the always exciting 400 free relay, saw a similar fate — a third place overall finish for the Bears, but a school record broken. Despite being too far out of reach to eclipse the Longhorns’ overall leading score, Lynch, Seliskar, Hoffer and Jensen took home a new school record of 2:46.54. Almost miraculously, Cal didn’t win one individual or relay event en route to its second place finish — a testament to the level of accomplishment it took to even be as close as the Bears were. “There are still opportunities for us to improve as we go from this year to next. I’m just happy with how we did, and that says a lot,” Durden said. The star of the meet was undoubtedly Florida senior Caeleb Dressel, who made national headlines after breaking three national records in four days. After updating his own 50 free national record in the preliminaries with a swim of 18.11, Dressel broke the 18-second barrier in the finals with a blistering 17.63, a full second ahead of his competition. To top the stardom off, the senior swam a 17.30 split in the 50 free as part of the 200 medley relay. As for the Bears, the stars didn’t align for Cal to take home the title this season, but their presence on the national stage certainly did not lessen. With several new school records to their name, the Bears have a lot to build on in their quest to chase down the Longhorns come next season.